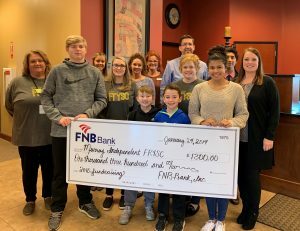 FNB Bank donated $2,600 to the Family Resource Centers of Murray Independent Schools and Calloway County Schools as a result of the bank’s 2018 philanthropic efforts in Murray-Calloway County. The Resource Centers for both schools work to ensure that all students have the opportunity to succeed by identifying unmet needs affecting children and families and mobilizing available resources to help meet those needs. They also organize programs and provide services in such areas as job/career counseling, parenting, youth enrichment and childcare. FNB employees coordinated and participated in numerous fundraising events benefiting the Family Resource Centers throughout 2018, including various jean days and an April Cookout. In addition, FNB employees from the Murray Office assisted with serving meals during the Summer Feeding in the Park program, provided a “personal” shopper for new school clothes at the First Loves Murray event and helped to stuff backpacks in preparation for the Back to School Blast. Employees also volunteered to support the Murray Tiger and Calloway Laker Christmas programs via donating time and gifts to the causes. 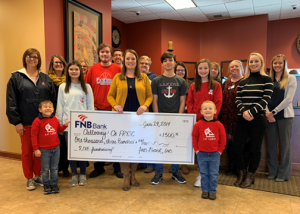 Christmas tree tags from both schools were also available at FNB’s Murray Office; these tags provided support to local families in Murray-Calloway County that needed assistance during the holiday season.